If you’re considering becoming part of the online betting community then it’s important you familiarise yourself with responsible gambling. Sure having a punt on your favourite sports team is fun. Sure placing a bet at the races can be exciting. Be that as it may, it’s not worth it if responsible gambling is beyond your reach. I have to admit that when creating this site I worried about people who had a problem with responsible gambling. Then I thought they would still have a gambling problem whether it existed or not, Also, it wouldn’t be fair to the countless multitude who get a kick out gambling responsibly. I decided the only fair thing to do would be to provide them with the information as which to which are the best online sports gambling sites to join, as well as outlining the perils of not gambling responsibly. If you’re the sort of person that has to keep gambling in an attempt to recoup your losses then you are a problem gambler. 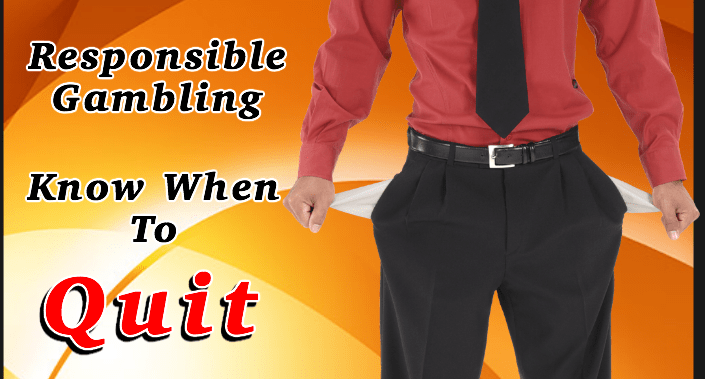 Responsible gambling is when you’re able to stop anytime you want. Gambling to you is just another form of entertainment and not something that you are compelled to do. Responsible gamblers only use money they can afford. They don’t use money that was meant for food or rent. They certainly don’t use money earmarked for things like paying off the home loan or a college fund. Responsible gambling is when you don’t have the need to borrow money just so you could place a bet. You certainly wouldn’t pawn stuff to feed your gambling needs. They do not go beyond their gambling budget. They set a certain amount and once that is reached they don’t have a problem stopping. So, you have to sit back and ask yourself, do you have a gambling problem? You Have A Gambling Problem If……..
…you don’t know when to stop. You will continue to gamble until you’ve run out of cash. … you’re feeling guilty about your gambling habit. I know when I’m feeling guilty it’s because I’ve done something wrong. As far as problem gambling goes its better to remove the guilt by stopping rather than letting it eat away at you until its too late? Just remember, if you have a gambling problem you will ruin more than than your own life You’re also ruining the lives of those who love you. Don’t allow yourself to fall into the trap of becomming a problem gambler. Learn to recognise the signs before they turn into a problem. If you feel you need help just remember it takes more strength to admit you need help than to deny it. Admitting it will be a great hurdle. Once you’ve done that you can seek help. More resources on responsible gambling. Next time I venture to the casino I can pick one up and scan it for you. If you are interested I wrote an article at Live The Bond Life called “Gambling as entertainment”. Maybe your readers will find it interesting. Hey Troy, getting a look at that brochure would be really interesting. As for the article, I’ll take a look at it. Who knows, maybe it will inspire me to write something. Naturally I will link to the article. I will get it for you. Do I have permission to use the email address you used to register on my blog? I always appreciate good links. Cheers! Yes, and a notify me of followups form. Anyway I got the brochure for you last night after my 500 hands of poker. 500 hands? Yes. I call that Thursday night. LOL! Hey Troy, wow 500 hands! How long did that take you? Contact form now installed as well as Commentluv Premium which has the replyme and some other really neat features. Thanks for that link too, it iwas really interesting.